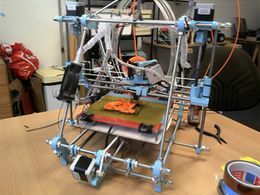 buZz and Niz are participating in bitlair's 3d printer workshop to build a Reprap Prusa Mendel v2 for the space gear. A manual for printing can be found here. http://www.thingiverse.com/thing:21502 <- filament spool mount (not happy with this one, will change someday ..